It seems I missed this Pew Research Report but a survey was published in November describing American’s attitudes toward death and dying. Here is a synopsis of the report according to Huffington Post. Keep in mind that it is always best to see the actual report to get a true picture, but I think the information below does present an accurate portrayal nevertheless. 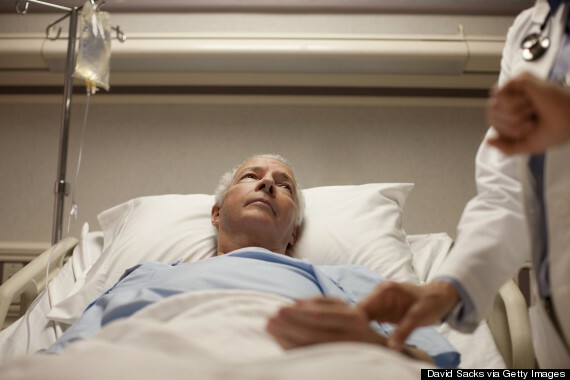 Pew Research Center‘s new report, “Americans’ Views on End-of-Life Medical Treatment,” explores the individual preferences and choices that surround the universal experience of death. However, starting the conversation about the end of life is not always easy, and a large chunk of U.S. adults haven’t given much thought to their preferences at all. But discussing death doesn’t have to be morbid. In fact, it’s often an excellent idea to talk about preferences before it’s necessary. That’s the idea behind “Death Over Dinner,” which are meals organized in order to connect friends and strangers through conversations about life and death. These facts drawn from the Pew survey about American attitudes towards death show the importance of thinking about the end of life, and communicating with loved ones about preferences. The share of the total U.S. population that is age 65 and older has more than tripled over the last century, from roughly 4% in 1900 to 14% in 2012. 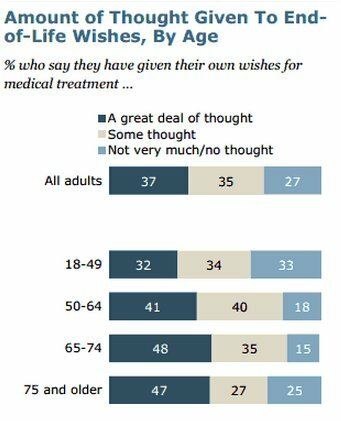 Fully a quarter of adults (27%) say that they have not given very much thought or have given no thought at all to how they would like doctors and other medical professionals to handle their medical treatment at the end of their lives, even those aged 75 or older (25%). 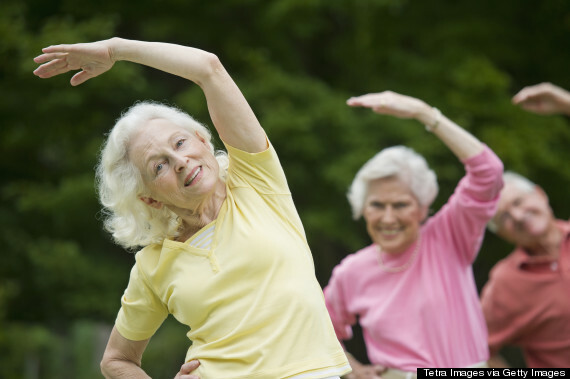 The average life expectancy in the U.S. is now 78.7 years. 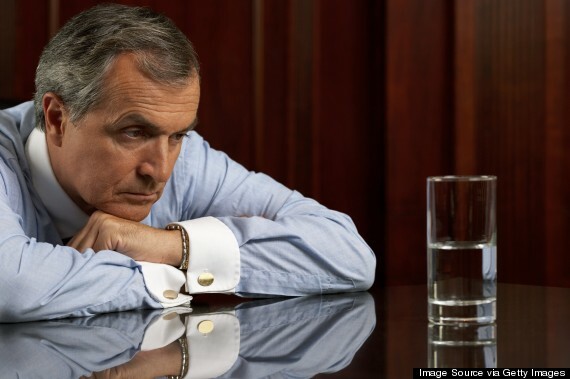 57% of adults say that they would tell their doctors to stop treatment if they had an incurable disease with no hope of improvement and were suffering a great deal of pain. 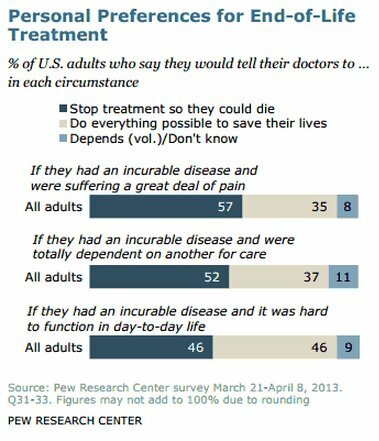 About a third of adults (35%) say they would tell their doctors to do anything possible to keep them alive, even if the circumstances were so dire that they had a disease with no hope of improvement and were experiencing a great deal of pain. 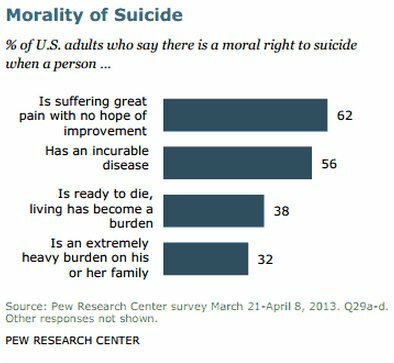 62% of adults say that a person suffering a great deal of pain with no hope of improvement has a moral right to commit suicide. 47% of adults approve of laws to allow doctor-assisted suicide for terminally ill patients, while 49% disapprove. 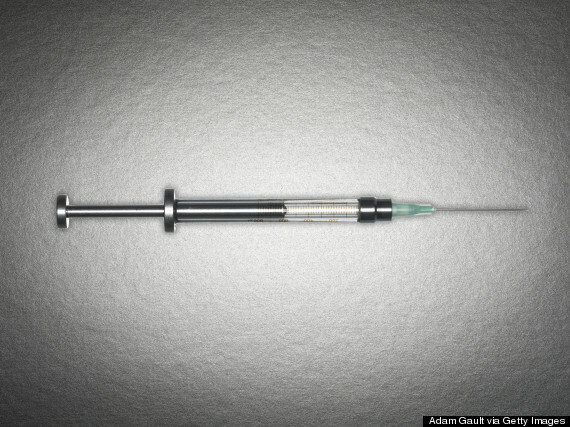 Only 26% of white U.S. adults would ask their doctors to do everything possible to save their lives if they had a disease with no hope of improvement and were suffering a great deal of pain, in stark contrast with the 61% of black adults and 55% of Hispanic adults who would want the maximum effort expended on life-saving strategies. About half of adults (47%) say they have a friend or relative who has had a terminal illness or who has been a coma within the last five years. 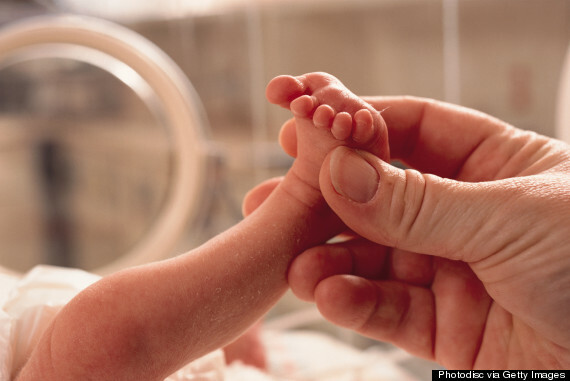 38% of adults believe that a parent has a right to refuse treatment on behalf of an infant in the case of a life-threatening birth defect, while 57% say that an infant should receive as much treatment as possible, regardless of the defect. 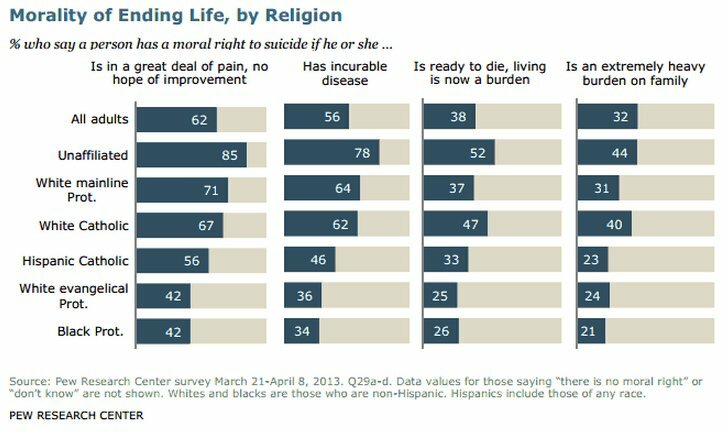 Black Protestants are most inclined to reject the idea of a moral right to suicide, out of the religious and racial groups surveyed. Religiously unaffiliated adults were most likely to support a moral right to suicide. 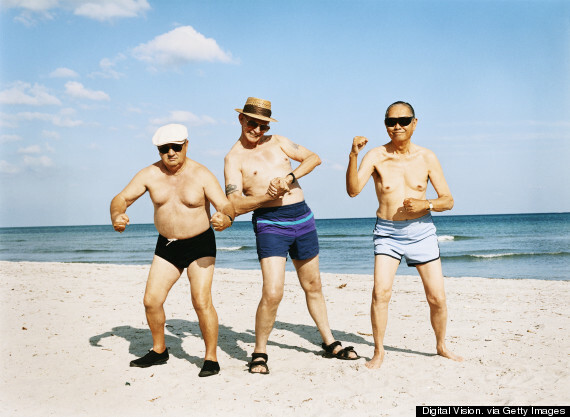 Only about a fifth (19%) of adults aged 75 and older expect their lives to be better in ten years compared with today, though 71% of people aged 18-49 believe that their life will improve in the future. 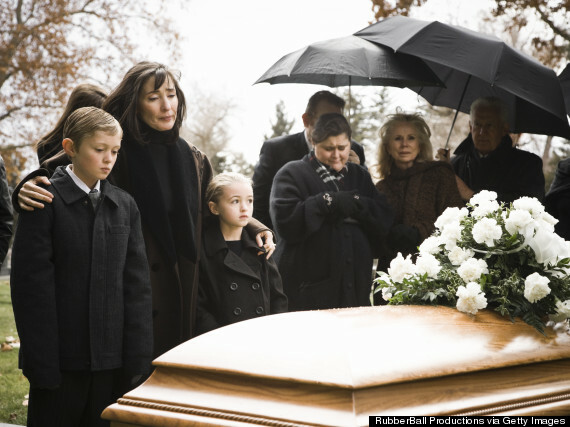 Pew Research Center first surveyed American attitudes about death in 1990, then again in 2005. This survey was conducted by telephone with a national sample of adults, 18 years of age or older, living in all fifty U.S. states as well as the District of Columbia. 1,994 interviews were conducted in English and Spanish from March 21 to April 8, 2013. The margin of error for the entire sample is ±2.9 percentage points. Note: In headlines, ‘Americans’ and ‘U.S. adults’ are sometimes used interchangeably for the sake of flow.